you need to have an plan of action, a strategy for using social media to get it in front of the right people at the right time. 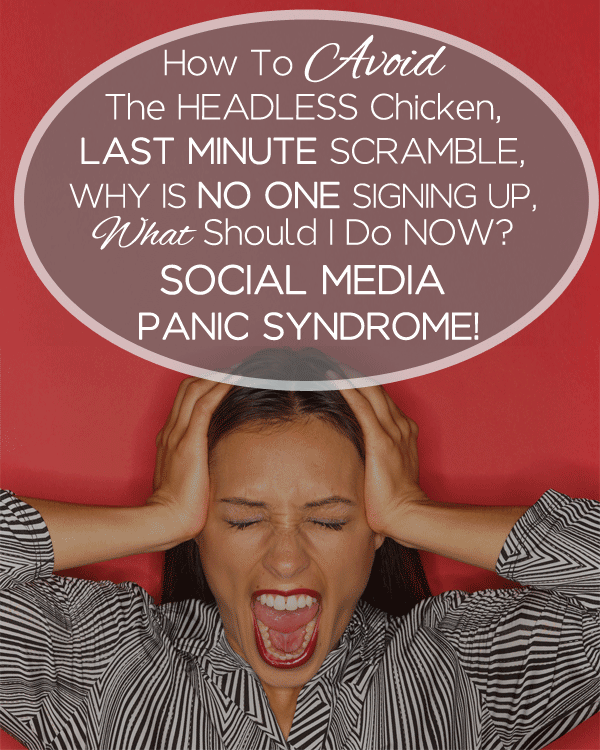 The worst thing you can do for your business is wait until you’ve finished creating everything and make a mad unplanned, uncoordinated, headless chicken scramble to get the word out and get clients. You know what it’s like. You’re like a mad scientist. deep in research and development. Creating, testing, planning, mixing. Happy and tired. In the cave/laboratory for days, weeks sometimes months. You come crawling out and realize you have to start marketing. The amount of work to narrow down an idea, flesh it out, create it, design it so it’s ready to be a viable offer that delights your clients as well as your PayPal account can seem endless and exhausting. Anyone who tells you otherwise ain’t telling you the truth. Your business is run like one of Tyler Perry’s Madea movies. Written, directed, produced & starred in by YOU! Talk about a one woman/man show. How many of those products/services do you want to sell to meet your goal? Is it 1, 5, 20 or 100. List building with a free offer? How many people do you want to sign up? Write it down and put it in front of you. Put it in your planner. Journal about it. Make it real. You can even create a small vision board visualizing happy clients, how you feel meeting your goal and even what you want to do with the income you make. Specific – How many clients/customers do you want and at what price? Measurable – How will you know campaign is working? What will you measure? Website traffic? Clicks on your links? Engagement? Achievable – Do you have the resources and/or skills to pull this off? Realistic – Can you create it, build buzz for it, promote it and sign people up during your time frame? Time-bound – Set a dates to “open the cart” (make it available for purchase) and how far in advance you will need to start to make it happen. You may not realize it, but you probably have a different ideal client for each of your products. Many product launches and marketing campaigns fail because business owners fail to take the time to recognize that they have to have a different marketing campaign. The people interested in your one on one coaching are different from those who want your group coaching program. Your Do It Yourself client has a different mindset and budget from those looking for Done For You Services. Don’t market your offer and create marketing messages geared toward the wrong people. If you have an offer that didn’t get the clients you wanted, maybe there’s nothing wrong with your offer. So grab a piece of paper, go back to the drawing board and write out exactly who your ideal client is for this one specific offer. What keeps them up at night? What gender? Between what ages? What’s his/her story? Imagine opening a brick and mortar store without doing any research on who is the area? Not driving around to see what the area is like? If it’s a good location? Are you visible from the road? Is your target market interested in what you have to offer? Where can you place ads, banners or signage? It’s the same thing when you’re marketing online. Don’t wait until the moment you’re ready to promote your offer to figure out where your people are hanging out online. Maybe the people in your network of circle of influence may not need or want this particular offer. It might be time to expand your reach and either go to another social media site or join different social media groups. Possibly find another market you never thought of who are clamoring for what you offer. Imagine that at the moment you are ready to share content, engage and/or promote your offer you know exactly where to go. You’re not wasting time on Facebook, Twitter or Instagram figuring where to post or who to talk to. What hashtags to use. You will have confidence since you’ve done your homework. Get in your car and take a virtual drive around your social media neighborhood. To start, find specific Facebook and LinkedIn Groups where your ideal clients are spending time. Then, figure out which hashtags you should use to get found on Instagram and Twitter. Now that you’ve decided where you will go, decide on which social media activities to include in your Marketing Action Plan. Choose a few social media sites – don’t spread yourself too thin. Ask yourself what do you need/want/have to do to make sure enough of the right people know about your offer? BLOGGING: Will you blog about it? How often? Guest blogging? Do you need to reach out to someone? When? How many posts do you need to write? SOCIAL MEDIA GROUPS: Participate in social media groups? How many? Which ones? If they allow promos what are the rules? Are their specific days? LINKEDIN, FACEBOOK, INSTAGRAM OR PINTEREST: How often will you post on there? How many promotional posts do you need to write? EMAIL MARKETING: Using Mailchimp, Aweber or Constant Contact? When will you let your list know about your new offer? How many emails will you write? Look at your activities from Step Four and give yourself about six to eight weeks. Pull out your calendar and start penciling things in. This goes along with the not waiting until the last minute scenario. Start with the date your open the cart/the day people can hit the buy now button. Then count back 6 weeks and figure out what you want and need to do each day/week to meet your goals. This is where content shows you what makes him the king. He does a lot of the heavy lifting. Your blog posts, tweets, Facebook updates, Pinterest and Instagram photos are what get you noticed. Your content is The Man! From attracting clients and leading them to your website to starting & engaging people in conversations. Let him do his thing!. Scan your sales page and look for sentences and phrases that will attract your intended audience. Pull snippets from your blog posts for tweets, Facebook and LinkedIn updates. Look for images on sites like pixabay and create branded graphics for Pinterest & Instagram. If you’ve been building relationships chances are people who follow you and/or network with you will help promote by sharing a blog post or a status update. Easy for people to share: Create clicktotweets. A simple cut and paste, ask your online buddies and you’ve got a small army of people hitting the virtual streets for you. Easy for you to track: Like putting a GPS device on your car, use shortened URLs liked Google Shortener or Hootsuite, Be sure to review the data to see how many people are clicking on your links and when they’re doing it. You can always make changes to your content, time of day and where you’re posting when necessary. And there you have it. A little something to keep you from jumping straight up in bed in the middle of the night wondering if you forgot something. A simple plan to keep you sane, productive and on track to meet your goals. Whether you have an existing offer that you want to breath new life into or are in the planning stages of a new product or service, build time into your schedule to plan.